Want a new garage door or simply want yours repairing? 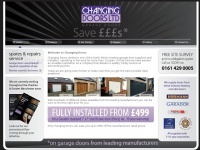 The professional team at Changing Doors Ltd have all the tools to make that happen. Call: 07766 088 781. The web server with the IP-address 93.184.219.4 used by Changingdoors.biz is run by EdgeCast Networks and is located in USA. There are many websites run by this web server. The operator uses this server for many hosting clients. In total there are at least 1,057 websites on this server. The language of these websites is mostly english.